When I was young, one of the regular card games we played was No Nines. Whenever I teach new people, they pick it up quickly and really enjoy playing. Few people know it. Objective: To run out of cards first. Set up: Take a standard 52 card pack. Remove the four nines and keep one joker, which becomes a wild card that can be any number you want. Suits are irrelevant. Deal out the cards individually, the last person will get one extra card than the others. That person will also lead off. Playing: The first person plays say an Ace (which are low, not high as in most card games), then two, three...for as long as they can. A player must play a card as part of a sequence if they are able. An example. "Ace, Two Three no Four". The person to their left says "Five, Six no Seven". The person to their left may say "No Seven". The fourth player may say "Seven, Eight no Nine". Of course there is no Nine, so the eight is what you would call a stopping card. They are useful as that player can now start off again anywhere they wish. They perhaps play "Ten, Jack, Queen, King". Another stopping card. Then "Ten, Jack, no Queen". So it would continue until someone runs out of cards. Tallying up scores: Ace is worth 11 points, Ten and all picture cards ten, with the rest face value (a six worth six for example). Four rounds are played and the person with the lowest points declared the winner. The Joker: It can be used at anytime, as any card, when it is the holder's turn to play. If a person is able to run out by playing the Joker as their last card, that means all other players double their score for that round. So there is incentive to hold it back to the end if possible. However, get caught with the Joker in your hand and you then have to double your score. The Joker can also be played as a Nine, so if someone says "Eight, no Nine" and is about to run out, the player with the Joker can quickly use it as a Nine so as not to be caught with it. The Ten would then follow the Nine played, whoever next is able to do so. The person who initially leads off for the first time can - if they choose to do so - play a multiple of the first card only. 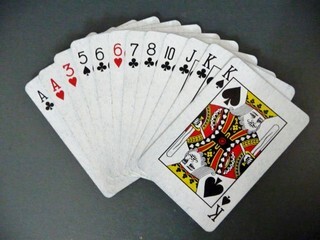 For example, a person has three Aces, not good as they are starter cards (also the Ten). They are easy to get stuck with. So they play "Ace, two, Three, no Four" and in doing so they could play three Aces at that time. Thereafter it is always only one of each number played. It is a bonus offer to the lead player for the first card down only. If it doesn't suit, then the player is not obliged to do so. Best played by four people. Enjoy, and if you have any questions, please leave a comment.